"These people are being treated like they are disposable. No one deserves that." This week’s episode is brought to you by the letter E for empathy. Something Team Arrow has and the Slabside employees are sorely lacking. As is The Demon for that matter. I was not surprised that Talia was “The Demon” so much as I was surprised that I didn’t see it coming. After all, had it not been Talia, calling the new Big Bad “The Demon” would have been a tad repetitive. I was happy to see she survived if only because we didn’t get to spend nearly enough time with her last season and I’d love to understand what makes her tick. As it is now, she’s a mass of contradictions. In return for the drugs that healed her after the explosions on Lian Yu, she was willing to help Diaz destroy Oliver. This makes no sense. If he was dead, then he couldn’t help her escape. And did she really think Oliver would have helped her if Diaz had been successful in killing Felicity and William? Or was she betting that Oliver’s ability to think strategically still decreases in direct proportion to his level of desperation? Either way, her gambit worked. Although, that had more to do with Oliver wanting to stop Dr. Parker’s experiments more than helping Talia. And what of the famous Dr. Parker? He had a sweet deal at Slabside. A steady supply of patients to conduct his experiments on without fear of reprisal. Then came Oliver Queen. It’s obvious he believed Oliver would be his great success story. Taming the Green Arrow would prove the validity of his treatment and justify his previous “setbacks.” This is fine as long as you ignore the fact we never delve into what the end result is supposed to be. Was Phase One a precursor to the real treatment, or did Parker think Inmate 4587 was cured? Was the goal to erase Oliver’s identity as an individual or just separate out his violent impulses? Was whatever occurred behind the blue door supposed to be Parker’s pièce de résistance or a Hail Mary for recalcitrant inmates? Curtis finally got his moment in the sun. Much to his dismay. Curtis has been stabbed and beaten up on multiple occasions, his husband left him and his boyfriend was shot because of him. Is it any wonder he wants out of the field? Much safer being A.R.G.U.S.’s “Felicity.” So why was Diggle so surprised? And once he learned why Curtis had such strong misgivings why push him so hard to get back out there? Having 14 Ph.D.’s and being able to speak six languages will not keep you and your loved ones safe even if it helps you disarm a bomb every once in a while. I am completely on board with the Felicity and Laurel team up. Felicity’s overcaffeinated pep and Laurel’s lack of empathy just works for me. Plus, it makes sense that Felicity’s willingness to break the rules and Laurel’s desire to live up to Quentin’s expectations of her have allowed the two of them to find common ground in a very muddy middle. What doesn’t make sense is the need to go through the SCPD’s hard copy files to find information on Dr. Parker. We’ll skip over the coincidence he practiced in Star City and move right on to the fact that if they stopped keeping up with the paper files once they moved to digital, why couldn’t Felicity find Dr. Parker’s cases from 2015? The SCPD has been digital for at least the last six years. I’m not trying to be overly negative. There were plenty of moments I liked in the episode. The first one being that even separated Oliver and Felicity managed to stop Dr. Parker from conducting any more experiments (Talia just made sure it never happened again). As much as I was upset for Dig pushing Curtis back into the field, I loved Curtis saving the day before A.R.G.U.S.’s insertion team made it through the door. 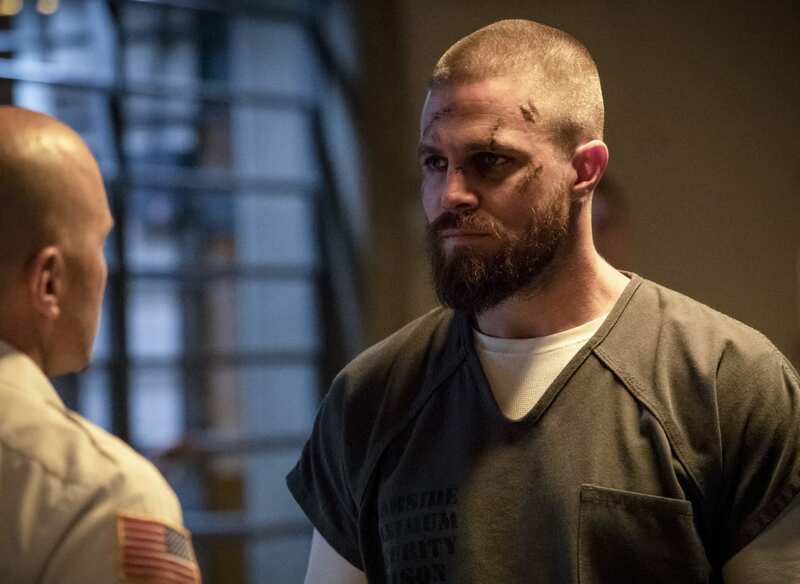 I’m also thrilled that 1) they didn’t free Oliver in the first episode of the season and 2) there is now a plausible way to get Oliver out of prison that doesn’t involve him being on the run for the rest of his life. We finally discovered The Demon’s identity, we sort of discovered what happened on Level Two, and we know where Diaz is. But a host of new questions have replaced the few we’ve answered. Now that Talia is free, will she go back to training assassins or does she have plans closer to Star City? Who at A.R.G.U.S. is moving great gobs of money around and what does it have to do Dante seeing hell? And what was Diaz looking for in Moscow besides Anatoly? I guess it’s a start. This wasn’t a horrible episode, but it sure was sloppy. Talia constantly refers to their fellow inmates as murderers as if Oliver and Talia had never killed people. I know Oliver’s face looks like crap but if he’d been hit with batons that many times he would have more than just bruises. Both Jean-Leon Gerome and his painting are real. Make of that what you will. I will go with the assumption that if Anatoly were dead, we’d have seen Diaz kill him. No wannabe Green Arrow and no flash forwards. Boo. Laurel: "I don’t know what’s more amusing, the fact that you just broke six laws in front of me or that you’re forcing me to feel empathetic about it." Felicity: “Well, we decided to start a support group for women who’ve been attacked by Diaz." Talia: “Well, I’m glad you’ve finally come to your senses, though I suspect your willingness to conspire comes with... conditions.